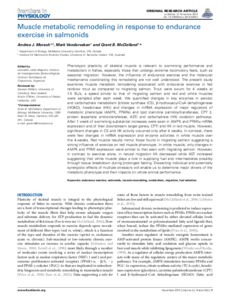 Phenotypic plasticity of skeletal muscle is relevant to swimming performance and metabolism in fishes, especially those that undergo extreme locomotory feats, such as seasonal migration. However, the influence of endurance exercise and the molecular mechanisms coordinating this remodeling are not well understood. The present study examines muscle metabolic remodeling associated with endurance exercise in fed rainbow trout as compared to migrating salmon. Trout were swum for 4 weeks at 1.5 BL/s, a speed similar to that of migrating salmon and red and white muscles were sampled after each week. We quantified changes in key enzymes in aerobic and carbohydrate metabolism [citrate synthase (CS), β-hydroxyacyl-CoA dehydrogenase (HOAD), hexokinase (HK)] and changes in mRNA expression of major regulators of metabolic phenotype (AMPK, PPARs) and lipid (carnitine palmitoyltransferase, CPT I), protein (aspartate aminotransferase, AST) and carbohydrate (HK) oxidation pathways. After 1 week of swimming substantial increases were seen in AMPK and PPARa mRNA expression and of their downstream target genes, CPTI and HK in red muscle. However, significant changes in CS and HK activity occurred only after 4 weeks. In contrast, there were few changes in mRNA expression and enzyme activities in white muscle over the 4-weeks. Red muscle results mimic those found in migrating salmon suggesting a strong influence of exercise on red muscle phenotype. In white muscle, only changes in AMPK and PPAR expression were similar to that seen with migrating salmon. However, in contrast to exercise alone, in natural migration HK decreased while AST increased suggesting that white muscle plays a role in supplying fuel and intermediates possibly through tissue breakdown during prolonged fasting. Dissecting individual and potentially synergistic effects of multiple stressors will enable us to determine major drivers of the metabolic phenotype and their impacts on whole animal performance.